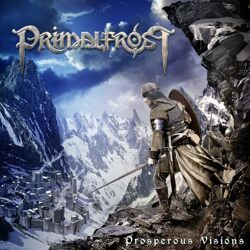 Canadian epic metal band Primalfrost from Toronto has just released its debut full-length album “Prosperous Visions“. Primalfrost was born in early 2012 as the personal project of Dean Paul Arnold, who composes and plays everything in the band. In September 2012 the band self-released the debut 5-track EP “Chapters of Time“, a 30-minutes long EP. Primalfrost signed to the Canadian label Maple Metal Records, who finally released the first full-length album of the band in early 2014. Dean Arnold formed the band with the idea to bring elements of genres like folk metal, melodic death metal, black metal, orchestral music and symphonic metal to an epic scale, and that’s exactly what Primalfrost offer! I find many differences in his music compared to his first EP, where he also did a very good job. “Chapters of Time” had a more folkish approach with direct references to Finntroll, while the new album is clearly more epic oriented. “Prosperous Visions” contains 10 songs and over 55 minutes of music. The band’s sound is now much more professional with a great production, while Dean is improved in every possible technical aspect! His guitars are amazing! Everything sounds now clearer and more powerful, from epic rhythmic riffs, to fast technical melodic leads and unbelievable solos. Synths are richer and more symphonic, drums sound more real, but the biggest improvement is in the vocals, especially the clean ones. Epic black death metal screams, combined with some clean power metal vocals and choirs, all performed by Dean with the perfect color and passion! In my opinion his clean vocals were the weak point of the first EP, something that makes such an improvement even more impressive. Compositions have become more complex, moving between all these different genres and changing from fast to slower tempos, but Dean is a very good songwriter, merging everything perfectly in a very tight album. All changes in music style and rhythm sound totally justified and they follow the epic atmosphere of the songs; it’s not just complexity for complexity. There are many melodic majestic parts in the album, as well as aggressive epic parts, acoustic passages, few folk metal and film-score elements, all under a somehow symphonic orchestral mood. Of course the lyrical concept of the album deals with epic themes and battles, all in English. Primalfrost has just released a very promising debut album. Dean Arnold is a very talented musician – orchestra, since not only he composes everything (in a very demanding genre with very rich orchestrations), but he also displays impressive playing skills! “Prosperous Visions” is released via Maple Metal Records in a standard jewel case edition CD including an 8-page booklet with all the lyrics. The really epic album artwork and layout is by Jan Yrlund of Darkgrove Design! You can visit the band’s official pages for more info and listen to their album in their label’s Bandcamp page. You can also check the official album video teaser below to get a first taste of their music.